The new year is looking to be a great year for cruising: Prices are low, space is plentiful, and eight cruise lines will introduce a total of 12 new ships to the open seas. Whether you’re a longtime cruiser looking for a new adventure or a first-time cruiser seeking the best amenities and itineraries, these new ships will be sure to satisfy all your wishes for a luxurious vacation. Plus, booking early can often lead to significant savings, leaving you with extra cash to spend onboard or on shore excursions. Carnival, Costa Cruises, Cunard Line, Holland America Line, Norwegian Cruise Line, Oceania, Princess Cruises, and Royal Caribbean Cruises are all introducing new ships this year, with the first already in service and the last debuting at the end of the year. Book now and you can take advantage of this year’s low prices, as well as having your pick of cabins and shore excursions. Read on to find out what’s new in 2004, including maiden voyages and applicable discounts. Carnival’s newest “Fun Ship,” Carnival Miracle will set sail for the first time on February 27. The 2,124-passenger and 88,500-ton ship will have the distinction of being the first Carnival ship to sail from the Jacksonville, FL, homeport. Carnival Miracle boasts a two-level promenade and a reservations-only supper club, and 80 percent of her staterooms have ocean views. She will sail three-day Bahamas and six-day Mexico itineraries, with stops in Freeport and Nassau, Bahamas; Key West, FL; and Cozumel, Costa Maya, and Playa del Carmen, Mexico. The third of the four sister “Destiny Class” ships, Carnival Valor will make her debut in December 2004. At 110,000 tons and 952 feet in length, she’ll carry 2,974 passengers and feature 22 bars and lounges, four swimming pools, three restaurants, recreation areas for teens, a 15,000-square-foot health club, and an Internet cafe. Based in Miami, Carnival Valor will alternate between Eastern and Western Caribbean itineraries; Eastern Caribbean cruises call at Nassau, The Bahamas; St. Thomas, USVI; and St. Maarten, Netherland Antilles, while Western Caribbean cruises call at Belize City, Belize; Isla Roatan, Honduras; George Town, Grand Cayman; and Cozumel, Mexico. Reservations are open for both the Miracle and the Valor. For information on specific itineraries, visit Carnival’s website, To book, contact a travel agent or call 888-CARNIVAL (888-227-6482). The fourth sister ship, Carnival Liberty, enters service in fall 2005. Soon to be one of the largest ships in Costa’s fleet, and one of the largest Italian cruise ships ever built, Costa Magica will debut in November 2004. She follows her sister ship, Costa Fortuna, which debuted in late 2003. Costa Magica provides its 2,720 guests with four restaurants, 11 bars, a three-story theater, three swimming pools, a casino, a disco, and a ballroom. She also has a total of 1,359 cabins, including 857 oceanview rooms and 458 with large balconies. No itineraries have been announced, but be sure to keep an eye out on Costa’s website, so you can jump on any early bird specials as soon as they come out. The first new ship to set sail this year, the Queen Mary 2 set off on her maiden voyage on January 12, sailing from Southampton, England, to Ft. Lauderdale. This superlative cruise ship is the largest (151,400 tons), longest (1,132 feet), tallest (236 feet), widest (135 feet), and most expensive ($800 million) ocean liner ever built, as Cunard likes to boast. In her first year, she will make 13 transatlantic crossings, as well as cruises from New York and Florida to the Caribbean, a trip to Rio de Janeiro and back, two New England and Canada fall foliage cruises, and five European cruises. Her other distinctions include restaurants headed by accalimed chefs Daniel Boulud and Todd English, a Canyon Ranch SpaClub, a planetarium, the largest ballroom at sea, and the largest wine collection at sea. Booking for the inaugural season is open and you can save with discounts on certain sailings, starting at $1,699. For more information, visit the Cunard website, and scroll down to the appropriate dates for QM2 sailings. To book, click on a cruise and then on “Booking Request.” Or, contact your travel agent. 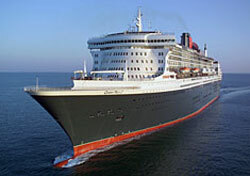 Also look for Queen Victoria, Cunard’s third queen, which will enter service in 2005. In April, the ms Westerdam takes her inaugural voyage, spending her first year in Europe and the Caribbean. She has a higher space-per-person ratio than the other Holland America ships, as well as more staterooms with balconies. Her 1,848 passengers can relax in one of six lounges, bars, and nightclubs; enjoy a private dinner at the reservations-only Pinnacle Grill; or pamper themselves at The Greenhouse Spa and Salon. Booking is open, and select sailings are available for free upgrades, if you book by February 29. You can find general information about 2004 cruises on the Holland America website by searching under “Destinations.” However, for specifics on upgrades, you can find sailings on Holland America’s “Special Offers” page or by calling the cruise line at 877-SAIL-HAL (877-724-5425). Norwegain is expanding into American waters with one new ship and one reflagged ship. Pride of America sets sail on her inaugural voyage in May. This new ship features 10 bars and lounges, eight restaurants, a tennis court, a conservatory, and an art gallery. Pride of America will spend most of her time in Hawaii, departing from Honolulu and cruising seven-day interisland itineraries. However, her first five cruises will be repositioning cruises to move her from the Atlantic to the Pacific Ocean. In addition, Norwegian’s Norwegian Sky will undergo a transformation and become the Pride of Aloha. Beginning in October, she will sail three- and four-day cruises from Honolulu with calls at Hilo, Hawaii; Nawiliwili, Kaui; and Kahului, Maui. Booking is open for the Pride of America and the Pride of Aloha. You can find specials for repositioning and Hawaii cruises on Norwegian’s “Weekly Cruise Specials” page. To book a cruise, call your local travel agent or contact Norwegian at 800-327-7030. Early booking discounts can save you between 42 and 50 percent; there is no deadline for the discount, but it will disappear as each cruise fills up. For more details, visit Oceania’s website, click on “Cruises and Destinations,” then “Select a Ship,” and choose Insignia. Then browse the itineraries in the middle column. To make a reservation call Oceania at 800-531-5619, or contact a travel agent. Princess is the most ambitious cruise line this year, introducting three new ships: Diamond Princess, Caribbean Princess, and Sapphire Princess. The 113,000-ton Diamond Princess sets sail in March for Mexico and the Pacific Northwest. Her sister ship, Sapphire Princess, debuts in June and will venture farther out in the Pacific, with cruises to Hawaii and Australia, as well as the Pacific Coast. Both ships can accommodate 2,670 passengers and feature 750 cabins with balconies, 24-hour dining, four swimming pools, a wedding chapel, a nine-hole golf putting course, and larger discos with 125-foot wide balconies. Caribbean Princess debuts on April 3, a few weeks earlier than planned. She will sail from Ft. Lauderdale to Eastern and Western Caribbean destinations. The largest ship in the Princess fleet, she touts a 300-square-foot LED screen for watching movies poolside. She also features nearly 900 cabins with balconies, “Personal Choice Dining” including a Caribbean-themed restaurant, and the line’s first in-house Lotus Spa. Princess is already accepting reservations for sailings on all three ships. Look for specials on Princess’s “Specials” page. For more information on itineraries and sailings, visit the Princess website, and enter your details under “Quick Search.” To book, contact your travel agent or call 800-PRINCESS (800-774-6237). The newest member of Royal Caribbean’s “Radiance Family,” Jewel of the Seas makes her debut on April 28. At 90,090 tons and with a passenger capacity of 2,501, she features a rock-climbing wall, theme bars and lounges, a specialty coffee house, a golf simulator, and a day spa and fitness center. Her inaugural sailings will be in Europe with 12-night Scandinavia/Russia cruises, plus two British Isles/Norwegian fjords cruises. She will make her U.S. debut in the early fall with 10-night Canada/New England sailings. Booking is open for Jewel of the Seas. To find itineraries, go to Royal Caribbean’s website and enter your details under “Quick Vacation Search.” To book, you can make a reservation online, call 800-398-9819, or contact a travel agent.